Joliet Regional Airport boasts the finest facilities available for people who like to fly. Whether it be for business or pleasure, our prices on fuel and hangars keep flying an enjoyable and economical experience. Upon your arrival, look forward to fast and courteous service, low fuel prices, and the availability to store your aircraft in a heated facility during your stay. Our staff will assist you in securing any services needed during your stay. 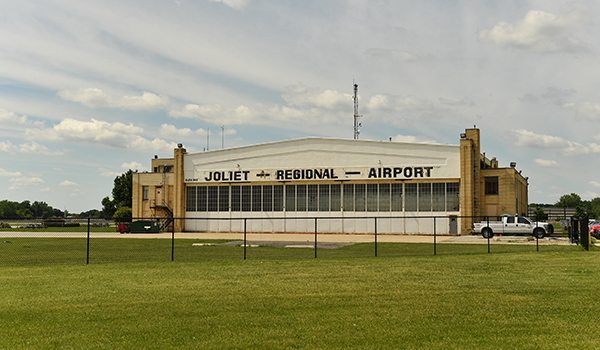 The Joliet Regional Airport is located at 4000 W Jefferson St., Joliet, IL, 60431. The Joliet Regional Airport is proud to announce that we are now a 24hr self service fueling facility. Drone usage is becoming more popular these days, but with that comes requirements that users follow certain important rules and regulations. Who must register a UAS? Which unmanned aircraft do I have to register? Weighs more than .55 lbs. (250 g) and less than 55 lbs. (25 kg). How do I register my UAS Online? It costs only $5 to register your UAS and the process is simple and web-based. Your registration is valid for three years. Once you receive a registration number, you must mark the registration number on all aircraft. The FAA has partnered with several industry associations to promote Know Before You Fly, a campaign to educate the public about using unmanned aircraft safely and responsibly. Individuals flying for hobby or recreation are strongly encouraged to follow safety guidelines. What are the safety guidelines? Don't fly within 5 miles of an airport unless you contact the airport operator before flying. The Joliet Regional Airport, open to the public, caters to both the corporate and casual flyer. We are located outside Chicago's "Mode C ring" for aircraft without transponders. 100LL, Jet-A, and Mogas are sold here at the lowest prices in the area with 24 hour self-service available. Heated hanger space is available for your overnight stay. Full maintenance and repair facility on-site along with flight school. Plenty of tie-down space is available on our paved ramp. Courtesy car available upon request. Always wanted to learn how to fly? Do you have a love of flight? What are you waiting for? Now is the time! The Joliet Regional Airport has a flight school, J.F. Aviation, located on the field. They have dedicated flight instructors and multiple aircraft to help you reach your goal. Contact them today! They can be reached at 815-744-7528 or jfaviation.com. Knowing your goal for learning to fly will help guide you along the path to the right certificate and all the rewards that flying has to offer. For Fun - Whether you want to just poke holes in the sky around your home airport, or fly to visit family and friends, learning to fly expands your options for fun! Go Pro - Professional pilot careers cover so much more than flying commercial! Explore the many aviation careers the world has to offer. Grow My Business - Avoiding security lines, parking hassles, and being at the whim of airline schedules are just a few of the benefits that priate flying offers the business person. airnav.com - Never been to a particular airport before? Want to know about the runways, location, frequencies and so forth? fltplan.com - The simple way to file a flight plan!